What I'm Drinking: Oscar Wilde once wrote, "Consistency is the last refuge of the unimaginative." I wholeheartedly agree with him, except in the case of coffee. With the huge range of fall coffee drinks available, I still tend to end up drinking my dear old friend, the vanilla latte. There is something about sitting in a coffee shop, listening to live jazz music and sipping one of these gems. With that being said, next week's goal is to branch out a little and try something new. We'll see how that goes - I may end up back with my old favorites. But Oscar Wilde also says that "Only dull people are brilliant at breakfast." Life motto right there, friends. Sports. Don't read this wrong - I am not the definition of a sporty person. Actually, if you were to look up sports lover in the dictionary, the antonym would be "Chloe Mooradian." It could have something to do with the fact that I haven't played an organized sport since 2nd grade community league soccer, which wasn't that great of an experience. I broke my wrist the day of our last game, and I only scored two goals that season - both for the other team, who jokingly said that I was their MVP. Typical Midwestern that I am though, I love watching baseball. Out of all the sports that are out there, I understand the concept of baseball. Hits, pitches, runs, and strikes are all words that I can gladly define. I don't have a certain team that receives all my loyalty, and I'll watch just about any team. However, I'm also a Kansas girl, and that spells some good news this weekend. For those of you who aren't baseball fans, let me catch you up to speed. 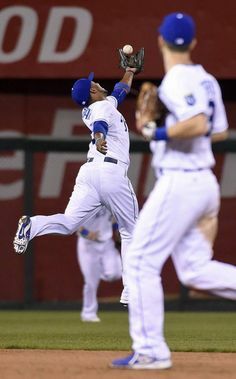 The Kansas City Royals are a team that haven't done so hot in quite a while. Actually, let me throw down some statistics for you. The Royals were founded in 1969 and as a team, they were pretty decent. In fact, between 1976 to 1985, the team actually qualified seven times for the playoff seasons. In 1985, the Royals won the world series and then after that, things took a turn for the worse. For 28 seasons from 1986 to 2013, the Royals did not place high enough to play in the postseasons. This statistic meant that the Royals had one of the longest postseason droughts in the wild-card era of baseball teams. Not a number we're proud of. But then 2014 hit - and we all partied like it was 1985. The Royals made it all the way to the end, playing against the Giants in the World Series, but the crown was not meant to be Royal, and they lost. 2015 rolls around and here we are again, in the nicknamed oKCtober fall season - and the Royals are again in the final two teams to play against each other in the World Series. Fans sit on the edge of their seat with bated breath, anxiously waiting for Tuesday's game - the first in a seven game series. This weekend at Mass, our priest had a brilliant quote. "Am I as excited and energized about winning the prize of Heaven as I am about the Royals winning the World Series?" How true. Seats at the Royals games are selling for hundreds and hundreds of dollars. Seats at Mass - the sacrifice where Christ's body and blood is made present in the Holy Sacrifice of the Eucharist under the appearance of bread and wine - those seats are free thanks to the grace of God - and also completely empty on the night of the game. At a parish near my house, the parish mission on evangelizing and the Catholic faith was cancelled because the event couldn't compete with the Royals game on television. What game are we concerned about? Are we pouring our energy and time into a game as temporary and fleeting as a baseball game instead of putting time and effort into things like our prayer life, the state of our eternal soul, and our relationship with Christ? Virtue stands in the middle - a balance between an enjoyment of the world God has given us as well as an eye towards the end goal. Who are you cheering for?